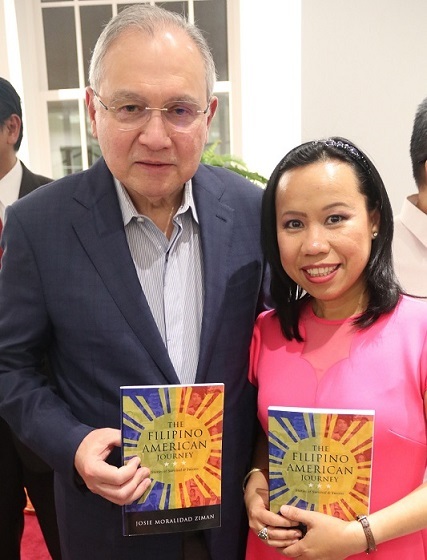 Ambassador Jose Manuel G. Romualdez and Josie Ziman during the launch of ‘The Filipino American Journey: Stories of Survival and Success’ at the Philippine Embassy. 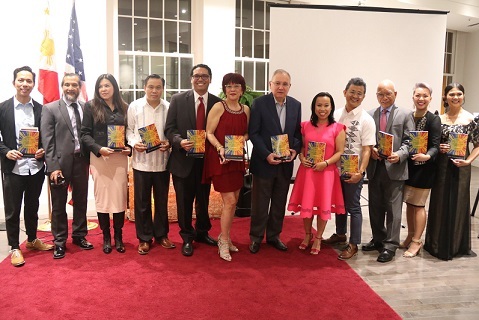 Journalist Josie Moralidad Ziman launched her book “The Filipino American Journey: Stories of Survival and Success” at the Philippine Embassy Chancery Annex on April 6. The book is a collection of inspirational stories that highlight the resiliency, determination, hard work, values, and faith of the Filipino people, said Ziman in a press statement. “What ‘The Filipino American Journey’ ultimately teaches us is that FilAms are not alone in their tribulations. There are now more than four million Filipino Americans in the U.S. who will be able to relate to any of the stories featured in the book. Josie’s skills as a storyteller help make this possible, as she weaves individual experiences into a narrative that gives hope and acknowledgement to the Filipino immigrant experience,” Philippine Ambassador Jose Manuel Romualdez said in his keynote remarks. Manila Mail President and founder Atty. Januario Azarcon and Editor-in-Chief Jon Melegrito delivered personal remarks to introduce the author of the book, Josie Ziman, who is also a staffer of the newspaper is based in Washington D.C.
With the personalities she had written about in her book. “My motivation is to live my life with courage, faith in God, and continue my civic duty in the community or public service as a journalist. That motivation inspires me to do things for others. What is the purpose of life anyway if we cannot give back to our community or help those who cannot help themselves,” Ziman said in her speech. The program featured several FilAms whose stories were featured in the book. They are Edward Logan (Fil-Am Beats Cancer with Faith, Hope and Family); Mike Seneriches (Pinoy Nurse Turns Hobby to Fashion Romp); Leolalinda Plameras (FilAm Nurse Wears Charity, Service as Badge of Honor); Ronie Mataquel (Reunion: Never Forgotten, a Grandfather Returns to Places in the Heart); Ramil Buenaventura (Filipino Educator Hailed for Innovative Teaching Method); Josie Harrison (Jo Koy’s Invisible Stage Partner); Melissa Tizon (The Saga of Alex and Lola); June Daguiso (FilAm Martial Arts Blackbelter Find Passion in Making Movies); Cristina Osmeña (Wall St. Whiz, Filipino Immigrant, Erstwhile Refugee Bucks Political Establishment to contest California incumbent in house race); and Louie Tan Vital (Catching a Glimpse of Chaotic World of Politics). “The Filipino American Journey” is available on Amazon. Proceeds will go to Friends of Cancer Kids (Iloilo) Foundation, Inc. and printing of Manila Mail.